This line of three jagged peaks was once the south-eastern side of an ancient volcano. It now forms the north-western third of the Cotopaxi NP. 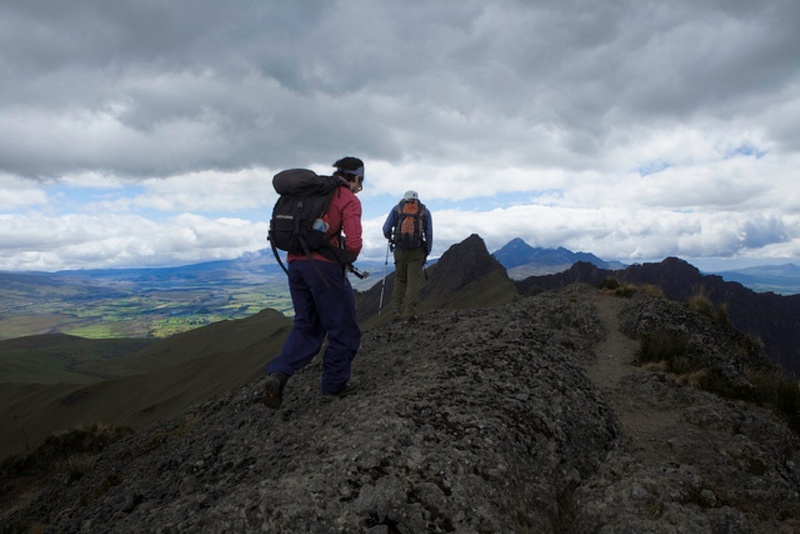 While the 360 degree views of the Avenue of the Volcanoes, and directly into the heart of Cotopaxi itself, are really thrilling, you don't have to climb to the high ridge to have a fantastic walk: there are excellent routes on the lower slopes. This line of three jagged peaks was once the south-eastern side of an ancient volcano, the rest of which has long since collapsed. It now forms the north-western third of the Cotopaxi NP. It is named after one of the generals of the Inca king Atahualpa, who was captured, tortured to extract where he had supposedly buried gold in his charge, then put to death by the Spanish. 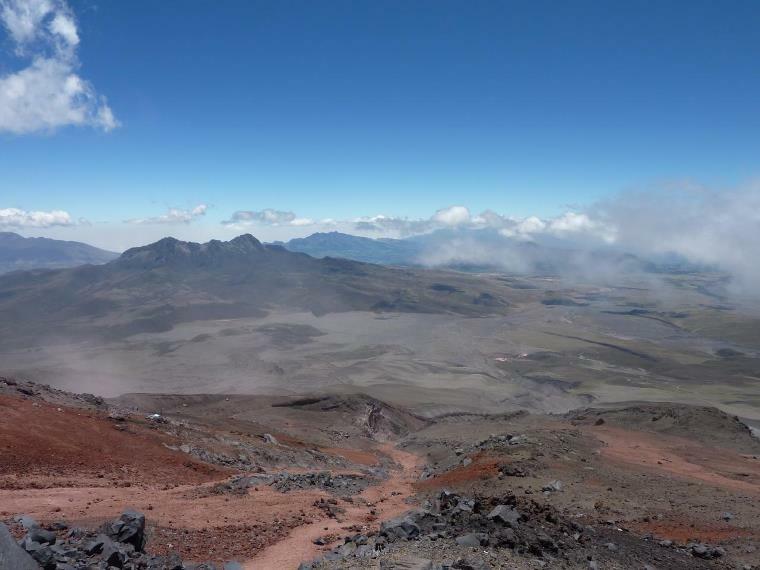 While the 360 degree views from the top of the Avenue of the Volcanoes, and directly into the heart of Cotopaxi itself from some 13km away, are really thrilling, you don't have to climb to the 4,631-4712m high ridge to have a fantastic walk with magnificent views. 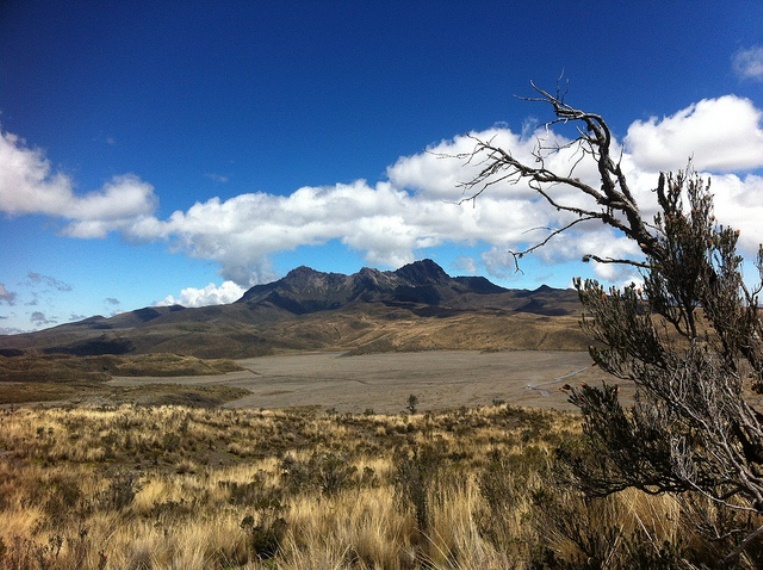 The most used route is from Laguna Limpiopugno, which lies between Ruminahui and Cotopaxi. While this involves a climb of 1,800m or more it isn't difficult, except from some easy-ish scrambling to reach the central peak (the lowest at 4,631m). 4-6 hours from the lake. There are also approaches from the Tambopaxi hotel on the north edge of the park, and from the Macahachi direction, which will be much longer walks as starting lower, but can be used to create a fantastic 2 day traverse of Ruminahui to Laguna Limiopungo (and as the first days of the Cotopaxi loop. The north peak is a serious scramble; the south peak is a rock climb. Neither are accessible from the summit ridge. If a full ascent isn't your thing, you can make wonderful walks on the slopes, whether following part of the climb or traversing around the hillsides. Walkopedia did a lovely 5 hour walk from Hacinda El Porvenir on the north-eastern slopes. See William Mackesy's account below. For more information and photos, including detailed practical information and some warnings, see our Cotopaxi Area page. I made this walk up onto a ridge-flank from Hacinda El Porvenir with my 13 year old son on Christmas Day 2015. This was his first walk at altitude, so our ascent was slow. We were with a local guide, which made a lot of sense as way-finding around here would not have been easy, with the return path quite faint through thick scrub.